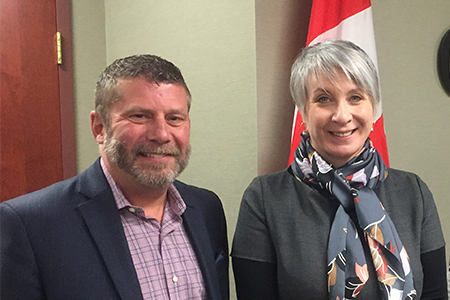 Jay Yakabowich (left) joined by The Honourable Patty Hajdu, Minister of Employment, Workforce Development and Labour. I served in the Canadian Armed Forces as both a reservist and regular forces member before transitioning into the private sector. Since then, I’ve held senior-level leadership positions in North American firms, including Artificial Intelligence In Medicine, Friesens Corporation, Jostens and Renaissance Learning. Today, as senior vice-president at Career Edge, my military skills have remained with me and shaped who I am as a person, as a professional, and as a leader. 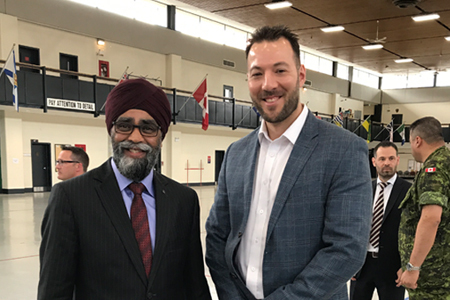 Much of what I learned and built-on during my tenure as a Canadian soldier are valuable attributes of what and how I do in my civilian job today – the importance of proper planning, involvement of stakeholders in the planning process and on-time, on-plan delivery of same. I joined the Canadian Armed Forces Army Reserves in 1999 and am still actively involved. I am a Reserve Infantry Sergeant with the Royal Hamilton Light Infantry. Throughout the years, I’ve held many roles within the CAF. I spent just over eight years on full-time Reserve contracts in which I worked with three different organizations within the CAF and completed one operational deployment. The two roles most relevant and influential with regards to my civilian education and experience was with military recruitment, and divisional training standards. Aside from those positions, the common core tasks of being a Senior NCO in the military have trained me to be a leader, a coach, a mentor, and a professional. Through continuous training and development, I’ve mastered time management, and operational planning and coordination. Leadership, and people management are other skill sets I continue to utilize and improve in the Reserves that directly relate to my civilian career. Circumstances in my personal life required a move to Toronto which meant ending the full-time Reserve contract and returning to part-time service. This meant I’d also need to find a civilian role while moving cities. To facilitate that, I utilized the services of Canada Company to assist in my transition and landed at Career Edge as a project manager. Career Edge fully understands the abundance of transferable skills I bring to the organization, as well as the requirements of Reserve service. They’ve been very supportive in my after-hours responsibilities and accommodate the time I need to continue to train and advance my rank and position. My military journey began early in high school as a member of the Army Cadets. I instantly fell in love with the emphasis on teamwork, leadership, and physical fitness. At 18, I enrolled at the Royal Military College of Canada as an armour officer with theRoyal Canadian Dragoons, operating out of Canadian Forces Base Petawawa. 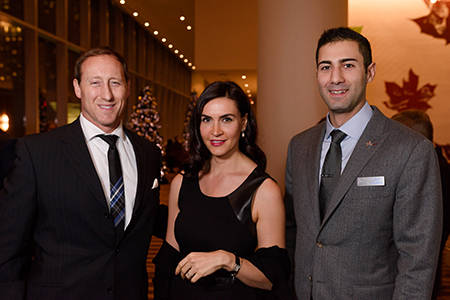 Sami Mandalawi (right) joined by Mr. Peter MacKay, former Canadian Attorney General and Minister of Justice, Minister of National Defence, and Minister of Foreign Affairs and his wife Nazanin Afshin-Jam, Human rights Activist and Co-Founder & President of Stop Child Executions. Armour officers provide reconnaissance and direct-fire support in battle from armoured fighting vehicles such as the Leopard main battle tank, the Coyote surveillance vehicle, and a variant of the wheeled Light Utility Vehicle. My military career brought me across Canada and abroad on training and humanitarian deployments. I had the privilege of leading Canada’s soldiers, which strengthened all areas of my life. The intensive training and discipline moulded my mind during those important formative years. My greatest lessons were in leadership. I learned a lot about what motivates human beings to be their own greatest versions. Firing people wasn’t an option. We deployed with the men and women on our team to battle, and made it work. There’s no crucible better suited to practicing the art of leadership. In the end, I learned leadership begins with treating humans the way they want to be treated and, ultimately, with self-knowledge. I transitioned into civilian employment as Director of Client Services at Career Edge in September 2016, thanks to Treble Victor Group, a network consisting of mostly ex-military members turned business professionals. It’s infinitely easier working for an employer who “gets it” and my manager has made me feel welcome and at home in my new outfit.